Bikes can be hired from Parkcycle by the hour for up to a maximum of 4 hours (except electrically assisted bikes which is a maximum of 2 hours). You may of course simply turn up and hire on the day however it is also possible to book in advance to not only secure your bike hire but to also enjoy the advanced booking discount of 10% (recommended for busy periods such as holidays and weekends). 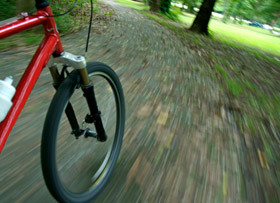 Please note that we do not offer daily bike hire or bookings for longer than 4 hours for individual hires. Prices vary by season with very low rates available in the low season periods! Please check the Opening Times & Prices page for prices (high, mid and low season rates). All hirers should be aged 18 years or over and have a valid photo ID, current bank card or passport. An advanced booking should be requested at least 24 hours in advance of the hire time and by 5pm at the latest on the calendar day preceding the day of hire. The Advanced Booking discount of 10% is only available subject to the payment being made in full. Advanced booking should be made by completing the advance booking request form. Once the form is completed and automatically sent to us we will contact you for to confirm all the booking details and take a card payment by phone (unless you have opted to call us during in opening hours). Visitors submitting the form from overseas or with a non-UK phone number please note that we cannot call you and can only communicate via email. We will therefore need you to call us by arrangement. Payments can only be accepted using a valid credit or debit card registered to your booking address. Once an advanced booking has been confirmed and payment taken the hire fee is non-refundable. However provided that at least 24 hours’ notice is given it is possible to request a booking alteration (for example time of hire or the number of bikes) which Parkcycle will endeavour to accommodate. Full details on the terms and conditions for advanced bookings are available for download here or a summary can be seen in section 4 of the summary terms and conditions. The Hirer and Customers included in the Advanced Booking should arrive at least 10 minutes prior to the requested hire time. No refund or credits shall be given on the Booking if the Hirer fails to arrive or at a time other than the time expected. Hirer should ensure that they have the card used for any payments taken over the phone in their possession when arriving to collect the bikes for hire. Any Advanced Booking Customer(s) that arrive at Parkcycle for bike hire and is judged by Parkcycle to be under the influence of alcohol or drugs shall be refused hire; and in such a circumstance the Parkcycle shall be under no obligation to offer a credit, refund or re-book option for the bike(s). Bike Fit: Our staff will assist you in finding the right bike and accessories for your bike hire. Once the bikes are selected we will need to enter your bike numbers onto the system at the counter and take any payments that may be due. Security: To ensure against loss or damage, we require either a valid ID or a deposit of £100 to be kept for the duration of your booking. If you choose to leave an ID it must be a photo ID driving licence, a valid bank card or a passport. Accepting Terms of Hire: All hirers have to sign a hire ticket to confirm that they have checked the condition of all the bikes being hired and that they have understood and accept the terms and conditions of hire. 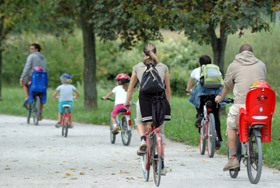 Test Ride Allowance: All hirers will have a 10 minute period after starting their booking to test ride their bikes. If you are unhappy with the bike you can change it within 10 minutes from the time of hire and re-start your hire time. If bikes are tested but returned outside the initial 10 minute test ride period, customers may not be credited with added time to their booking. Whether hiring on the day or booking in advance all hirers will be required to sign for the bikes included in the booking at the time of hire. Hirers need to be aware that by signing at the time of hire you and all included within the booking are bound by the Parkcycle Terms and Conditions and that you are accepting that the bikes being hired are safe and in good working order. Any bikes that are returned beyond this time may be charged for. The amount of the excess payment required for late return will be calculated by multiples of a quarter of an hour using the rate charged for the first hour of hire under the Booking. Please not that no credits or refunds will be given for any bikes hired under the Booking that are returned in advance of the agreed return time.